Themes of the American Civil War offers a timely and useful guide to this vast topic for a new generation of students. The volume provides a broad-ranging assessment of the causes, complexities, and consequences of America’s most destructive conflict to date. 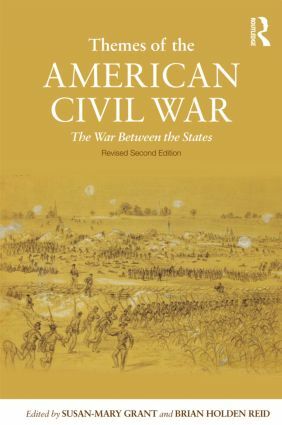 The essays, written by top scholars in the field, and reworked for this new edition, explore how, and in what ways, differing interpretations of the war have arisen, and explains clearly why the American Civil War remains a subject of enduring interest. It includes chapters covering four broad areas, including The Political Front, The Military Front, The Race Front, and The Ideological Front. Additions to the second edition include a new introduction – added to the current introduction by James McPherson – a chapter on gender, as well as information on the remembrance of the war (historical memory). The addition of several maps, a timeline, and an appendix listing further reading, battlefield statistics, and battle/regiment/general names focuses the book squarely at undergraduates in both the US and abroad. PART II And the War Came . . . The First of the Modern Wars?